There are a number of things you swear to yourself that you will do for your child before he comes into the world.You get notions, many, many notions and you scorn at other mammies and daddies who do not conform to your perfect ideal of what parenting should entail. While pregnant with Mini, I decided I was going to breastfeed for at least 6 months, that when she moved onto solids, she would never eat from a jar of processed baby muck, and that there would be no T.V. in her early days, at least not until the age of 3. It just seemed like such a lazy option to plonk a child down in front of a T.V. set and forget about her. Then after 9 months of planning and dreaming, life takes over. Breastfeeding is hard, a lot harder than I ever imagined and it was nothing but formula for Mini from only 2 months on. At first, I was gutted, felt like I had really let my child down, but guess what? Mini survived and thrived on the formula. Then with all the time spent adjusting to solid foods, the change in routine from the comfortable bottles only and the hours spent washing, peeling, dicing, cooking and pureeing food into mini-acceptable nutrition, we realised that a jar of “processed baby muck” every now and then was ok.
And who’s that glued to the T.V. 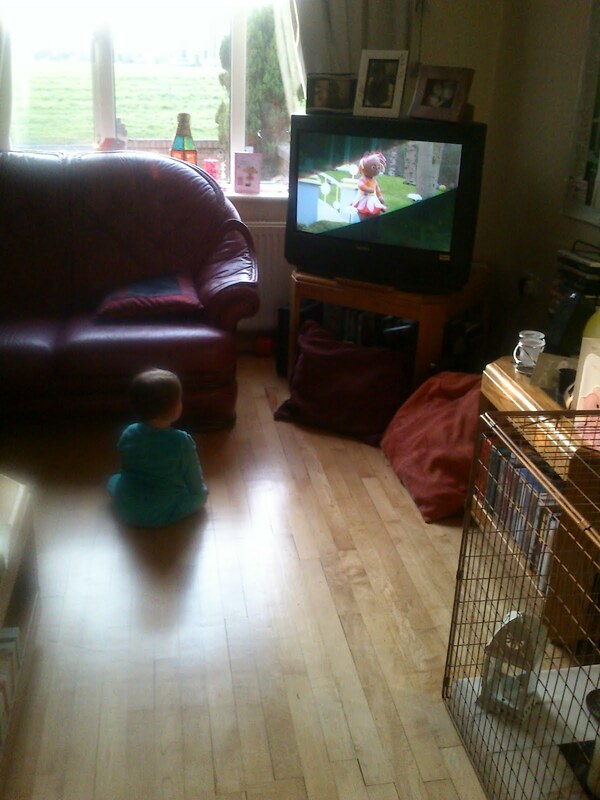 ?It’s Mini, enjoying her daily 20 minutes of ‘The Night Garden’, a rather sweet programme on Cee Beebies. It calms her down before bedtime and it seems to help with her imitation skills, which are both big pluses in my book. So while pregnant me might have sneered at this seeming lack of “good parenting”, mother me is more relaxed and realistic about the whole thing. You want to do everything you can to give your children the best possible start in life. Sometimes the best thing is just being there and letting go of preconceived notions you may have thought were set in stone . You’re still doing a great job-the proof is right there in front of you…reaching for the remote! There is no such thing as perfect parenting. One can always try but doing it is the fun part.